In the depths of an oyster garden. Growing your own shellfish is catching on all over the East End. This spring, East Hampton Town’s shellfish hatcheries in Montauk and Springs are pairing up with a crew of eco-conscious South Fork residents to form the East Hampton Shellfish Education and Enhancement Directive (EHSEED), a pilot community oyster garden on Three Mile Harbor. EHSEED is following in the footsteps of Cornell Cooperative Extension’s Southold Project in Aquaculture Training (SPAT), which began a decade-and-a-half ago and now has nearly 200 members who grow oysters in Southold’s Cedar Beach Creek. Since then, the Shinnecock Restoration Project and Stony Brook University’s School of Marine and Atmospheric Science have begun reseeding Shinnecock Bay with oysters, and Moriches Bay has followed suit. EHSEED hopes to recruit 15 families and individuals to join the garden in 2016. They’ll provide lectures and workshops, similar to those at SPAT, at the town shellfish hatchery and nursery in Montauk and Springs, and the South Fork Natural History Museum has signed on to help with community outreach, along with Veterinarians International. The annual membership fee is $250, which entitles participants to training, 1,000 oyster seeds and the gear needed to grow them to harvestable size by the end of the second growing season. The program is currently only open to residents of East Hampton Town, and participants must attend at least one of the first two lectures and attend gear maintenance meetings once a month. The program is kicking off this weekend, on Saturday, May 14 from 4 to 6 p.m. with a fundraiser and meeting at the Bay Kitchen Bar Restaurant at 39 Gann Road on Three Mile Harbor in Springs. Tickets are $65 per person, which includes beer provided by Greenport Harbor Brewing Company, wine by Channing Daughters Winery, oysters and other light fare, and a tour of the nursery. Tickets can be purchased by calling SoFo at 631.537.9735 or online here. The first lecture, on shellfish biology and broodstock conditioning (preparing adult oysters to spawn), will be held on Saturday, May 21 at 10 a.m. at the Montauk shellfish hatchery. The second lecture, on larvae and algae culture, will be also be held at the hatchery on June 25 at 10 a.m. 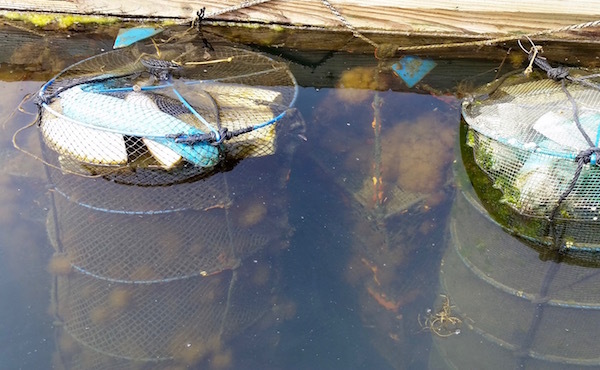 Participants will receive their gear and oyster seeds at the third meeting on July 23 at 9 a.m. at the nursery and oyster garden site on Gann Road on Three Mile Harbor, where they will launch floating growing cages. After launching the growing cages, EHSEED will hold bi-weekly maintenance meetings on August 6 & 20, September 3 & 17 and October 1 at 9 a.m.
A lecture on proper shellfish handling will be held on Sept. 10 at 5 p.m., with the location to be determined. Participants will seed half of the participants’ oysters, along with seed from the town shellfish hatchery, at the final meeting on Oct. 15 at 9 a.m. The remaining seed will overwinter in Three Mile Harbor, where they are expected to reach harvestable size in 2017. More information on this program and other East Hampton Town Shellfish Hatchery programs is online here.